by Chris Woodford. Last updated: October 4, 2018. Back in the 1890s, when French cinema pioneers Auguste and Louis Lumière screened their early movie of a train arriving at a station, legend has it that terrified members of the audience dived to one side to get out of its way. Despite all kinds of technological innovations in the decades since then, movies and TV never again seemed quite so convincing. Just over a century later, it seemed affordable three-dimensional television (3D TV) would usher in a new age of super-realistic entertainment, and the big TV manufacturers, such as Sony, Panasonic, LG, and Toshiba, soon started throwing their weight behind 3D technology. Unfortunately, consumers haven't been anything like as keen on watching 3D pictures at home and, for now at least, the revolution seems to have stalled: in 2013, The New York Times officially declared it "an expensive flop"; by 2017, leading makers such as Sony, LG, and Samsung had decided to drop the technology entirely. Despite that, 3D TV is still a fascinating technology, so let's take a closer look at how it works! Photo: A 3D television system being demonstrated by LG. 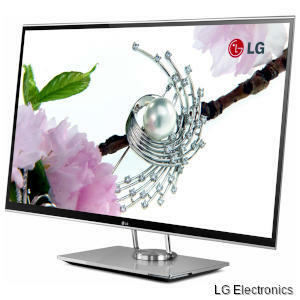 Like most other 3D TV systems, this one requires you to wear special eyeglasses (which we discuss in more detail below). Picture courtesy of LG Electronics published on Flickr in 2010 under a Creative Commons Licence. How and why do we see in three dimensions? It's easy to forget you're an animal, pre-programmed to survive as long as you can by millions of years of evolution. Eat or be eaten is the basic law of a world most of us no longer live in (or want to)—but it's the world your body was built for. Some 25–50 percent of your (relatively) huge brain is devoted to processing information sucked in by your eyes and rebuilding it into a colorful three-dimensional "movie theater" that wraps around your head. But your visual system is much more than just a fancy interior designer: it's main purpose is to help you survive. Seeing things in three, rich and deep dimensions is a shortcut to understanding how the world is laid out: how close that 'gator is and whether you can escape it or, in modern terms, how far you need to stretch your hand to lift that cheeseburger to your lips! 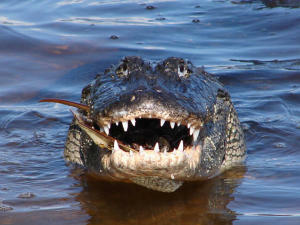 Photo: You have two eyes, spaced slightly apart, so you can judge distances accurately and avoid predators like this alligator; it has two eyes to help it catch you! The relatively close spacing of the eyes plays an important part in creating a 3D image of the world. If the eyes are too far apart, the images they produce don't overlap substantially, and an animal's brain can't effectively fuse them into a single 3D picture. Photo courtesy of US Fish and Wildlife Service. Our brains generate a 3D picture largely by having two eyes spaced a short distance apart. Each eye captures a slightly different view of the world in front of it and, by fusing these two images together, our brains generate a single image that has real depth. This trick is called stereopsis (or stereoscopic vision) and it's the seeing equivalent of using two loudspeakers (or a pair of headphones) to hear three-dimensional, stereo sound. We take seeing in three dimensions for granted, largely because it's almost impossible to view the world any other way—even if you have just one eye. Binocular vision (seeing with two eyes) is only part of how we perceive depth. With one eye closed, you'll find you can still get a pretty good idea of how the world is laid out thanks to many other "depth cues": lines recede into the distance in what we call perspective; closer objects are generally bigger than distant ones and move more rapidly as you move your head (an effect called motion parallax); nearer things have different surface textures than further ones; and so on. That's why even flat, two-dimensional images (photographs and moving images on movie screens and TV) give a reasonable approximation to depth. But if you really want to see a convincing image of the world, nothing beats putting a slightly different 2D picture in front of each of your eyes to jolt your brain into seeing them as a single, 3D image. And that's exactly the trick the latest 3D televisions are designed to play! Photo: 3D stereo might sound new, but it's been around for a very long time. Over a century ago, people amused themselves with stereographs: two images of the same scene, photographed from very slightly different angles, that you looked at with a special viewer to see a fused, 3D image. 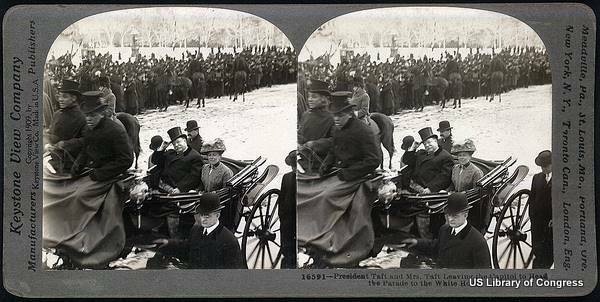 This one shows US President William Taft and his wife traveling to the White House in 1909. Photo courtesy of US Library of Congress. How does a 3D TV work? There are several different ways of making a 3D TV, but all of them use the same basic principle: they have to produce two separate, moving images and send one of them to the viewer's left eye and the other to the right. To give the proper illusion of 3D, the left eye's image mustn't be seen by the right eye, while the right eye's image mustn't be seen by the left. Photo: NASA's Mars Pathfinder rover captured crude 3D images of the planet using two separate lenses. Photo courtesy of NASA Jet Propulsion Laboratory (NASA-JPL). The simplest way of achieving this is to display two different images on the TV screen (one for the left eye and one for the right) and make viewers wear special glasses so each eye sees only one of them. The 3D technology most people have seen involves wearing eyeglasses with colored lenses, one red and one cyan, also known as anaglyph glasses. Why these two colors in particular? The red lens is a light filter that allows only red light to pass through, while the cyan lens (cyan is an equal mixture of blue and green) allows through any color of light except red. The point is simply that each eye isn't being allowed to see parts of the image that are being viewed by the other one, so each eye gets a slightly different picture of its own. While simple and inexpensive, this technique produces a relatively poor quality, monochrome picture and often makes viewers feel nauseous. 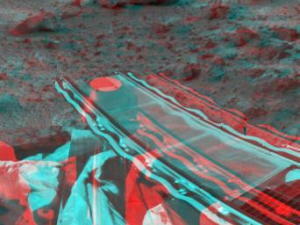 Photo: You'll need to wear anaglyph (colored) glasses to see images like this in three dimensions. A much more promising system uses polarizing lenses in the glasses instead and two pictures that are projected from the screen using differently polarized light. Normally, light is made up of waves that vibrate in multiple directions at once as they shoot in straight lines through the air, while polarized (or "plane polarized") light is filtered so its waves vibrate in one direction only. If you fit glasses with two different polarizing filters, so the left lens receives only light vibrating up-and-down while the right lens receives light vibrating side-to-side, you can easily beam a different image from a TV set to each lens. The main drawback is that the TV set has to be fitted with polarizing filters as well, which bumps the cost up quite considerably. A third option is more ingenious and involves people wearing active-shutter glasses. Battery powered, these have an electronic shuttering system that opens and closes the left and right lenses, in alternation, at very high speed. At a certain moment, the left lens is "open" and viewing the left-eye image on the TV screen while the right lens is blocked. A fraction of a second later, the glasses reverse: the right lens opens, the left lens is blocked, and the TV picture changes so your right eye gets a slightly different image (or "frame") to your left eye before the whole process reverses again. And goes on reversing dozens of times each second. This technology is also called alternate-frame sequencing. Photo: A pair of LG's active shutter glasses. If you look closely, you'll see this man is wearing his in front of a pair of conventional eyeglasses. Picture courtesy of LG Electronics published on Flickr in 2010 under a Creative Commons Licence. Although the "shutters" work like little blinds that open and close in front of your eyes, they're actually optical rather than mechanical: each lens of the glasses is fitted with a liquid crystal display that instantly turns transparent (clear) or opaque (dark) when it receives an electronic signal. The glasses are linked by infrared, radio wave, or Bluetooth to the TV set so they synchronize precisely with the rapidly changing pictures on the screen. Active shutter glasses like this are more expensive than passive ones (with colored or polarizing lenses), but give a better 3D image and can be worn for far longer without tiring people's eyes or making them feel sick. But the shutter system causes a significant loss of brightness and the flickering can be noticeable under certain conditions. Photo: In active-shutter glasses, the two lenses are switched on and off alternately by liquid crystals that change orientation under electronic control, either blocking out light (left) or letting it through (right). Photo from liquid crystal research by David Weitz courtesy of NASA Marshall Space Flight Center (NASA-MSFC). All three types of glasses can be a nuisance—especially if you wear glasses already—and that's why some people think TV manufacturers will need to be more ingenious and develop 3D technologies that don't need them. One option might be to use something like holography, but that would probably mean redesigning TV cameras so they use complex laser mechanisms that can capture depth, as well as patterns of light and color—and who knows how many decades that could take? Another possibility is to use lenticular TV screens, which work like those ridged plastic, lenticular printed book and magazine covers you see that show slightly different images as you tilt them back and forth. 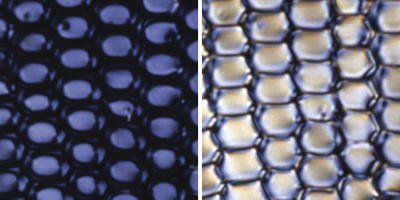 Lenticles are simply rows of very thin, parallel plastic lenses that bend images either to the left or the right. Place them in front of a TV screen and you could, relatively easily, send two slightly different pictures to a person's left and right eyes so they see a single fused image in three dimensions. Although some TV manufacturers have successfully developed lenticular 3D TV, it does have a big drawback: you have to be sitting in exactly the right place, at exactly the right distance from the screen, so your two eyes receive their intended images in just the right way. Move too far to the side, the illusion will collapse, and you'll probably just see a messy blur. While it doesn't sound that practical for family viewing, lenticular 3D could work extremely well with laptop computers (generally viewed by one person at a very precise position and distance) and handheld DVD players. Photo: The cover of my book Cool Stuff Exploded has a plastic lenticular coating so the picture changes as you tilt it from side to side. Place a lenticular coating in front of a TV screen showing two separate 3D images, side by side, and you could send separate images to a person's eyes without their needing to wear glasses. Why hasn't 3D TV caught on? "A few years ago, 3D was hailed as the next big thing in television... and now the eye-popping format is seen as an expensive flop." TV makers would love us to think we can instantly get 3D versions of all our favorite movies and shows just by shelling out for a more sophisticated box of electronics—but, of course, it's not quite that simple. To start with, the world has about a century of 2D movies and TV programs; any new 3D equipment that's developed for the foreseeable future will need to be able to play all this stuff as well. More seriously, imagine the extra cost of producing 3D programs and (worse still) outside broadcasts. You want to watch superbowl in 3D? Fine! But that means you'll need at least two cameras (and maybe two trained operators) on the pitch for every one that's there today. So, potentially at least, 3D TV programs could be much more expensive to make. If manufacturers and program makers are going to have any incentive to make 3D TV sets and programs to show on them, consumers have to get behind the technology too—and, so far, that's not happening. Many people simply don't like the 3D experience or find they can't watch it for long. And there's just not enough compelling 3D content (TV programs and movies) to persuade people the investment is worth it. That leaves 3D TV technology in something of a Catch-22 limbo: it's not worth developing programs if people won't buy the sets; and it's not worth buying a set if there aren't any programs to watch on it. For now, at least, it seems unlikely that 3D TV will graduate beyond short-lived novelty—but it was an interesting experiment, while it lasted. Anaglyph: You have to wear eye glasses with colored lenses so your brain can fuse together the partly overlapping red and cyan pictures on the screen. Polarizing: You wear lenses that filter light waves in different ways so each eye sees a different picture. Active-shutter: The left and right lenses of your glasses are fitted with liquid crystals that effectively "open" and "close" at high speed, in rapid alternation, so your two eyes view separate images (frames) shown on the same screen. Lenticular: You don't need glasses with this system. Instead, a row of plastic lenses in front of the screen bends slightly different, side-by-side images so they travel to your left and right eyes. You must sit in the right place to see a 3D image. 3D Television (3D TV) Technology, Systems, and Deployment by Daniel Minoli. Taylor & Francis, 2010/2017. Reviews the whole process of 3D TV, from image capture and broadcasting to final display, and includes some information about emerging trends such as holographic TV. Three-Dimensional Television: Capture, Transmission, Display by Haldun M. Ozaktas and Levent Onural (eds). Springer, 2007. Mainly intended for people involved in the development of 3D TV technology and related applications (such as medical imaging). Shambling corpse of 3D TV finally falls down dead by David Katzmaier, Cnet News, January 17, 2017. Sony and LG announce that they are dropping 3D TV in 2017. 3D TV is Officially Dead (For Now) and This is Why it Failed by Stephen Cass, IEEE Spectrum, January 7, 2014. Manufacturers have quietly dropped or sidelined 3D TV sets—and this article explains why. Future of 3D TV Murky as ESPN Ends Channel by Brian Stelter. The New York Times, June 16, 2013. Once ESPN pulled the plug on 3D, things started to look very bleak. Sports: 3-D TV's Toughest Challenge by Howard Postley. IEEE Spectrum, November 2012. Why does sport present a particular technical challenge for the producers of 3D TV programs? Why 3D TV Went From CES Darling to Consumer Reject by Christina Bonnington. Wired, January 5, 2012. High prices, lack of programs, and poor viewing experience are the reasons why customers aren't flocking to 3D, according to this analysis. Could 3D television be dangerous to watch? by Alex Hudson, BBC Click, January 28, 2011. Are there health risks for children from watching 3D TV? 3D TV is being billed as possible industry saviour by Maggie Shiels, BBC News, January 8, 2011. A new type of TV is a new marketing opportunity for manufacturers. US Patent 3,932,699: Three-dimensional television by Maurice R. Tripp, January 13, 1976. Describes a lenticular camera and display system. US Patent 20140218410: System And Method For Efficiently Generating Device-Dependent Anaglyph Images by Sirui Hu et al, Sony, August 7, 2014. A recent anagylph-type 3D image system. US Patent 2,865,988: Quasi-stereoscopic systems by Nicholas J Cafarelli, Jr., ITT, December 23, 1958. An early 3D system that could use either colored or polarized lenses. US Patent 4,967,268: Liquid crystal shutter system for stereoscopic and other applications by Lenny Lipton and Marvin Ackerman, StereoGraphics, October 30, 1990. This one describes active-shutter LCD glasses.